I AM. I CAN. I WILL! Your donation transforms, empowers and provides families living with multiple sclerosis to be more than their MS.
For the last three years, Jane spent much of her life in bed due to severe fatigue from multiple sclerosis. Like many people diagnosed with MS, she didn't receive much information about the disease she would be living with for the rest of her life. "It's terrifying," said Jane. "I struggled to manage the symptoms and emotional challenges that come with a chronic disease like MS."
Jane's aunt, who also suffers from MS, told her about the CAN DO? Program, which she herself had attended 17 years ago. "She knew the program would change my life, because it changed hers." Jane was able to attend the CAN DO program in August 2016 thanks to scholarships. "The minute I walked through the doors, I was welcomed with open arms, by people who understood what I was going through." Through your donations, Can Do MS healthcare professionals were able to give Jane the individualized attention she needed to learn how to manage her MS on a daily basis. "I was able to return to my job as a college counselor and now exercise five days a week." "I have a new outlook on living with this disease. Jimmie's motto to live an active life and not let the disease define him has inspired me to keep pushing on every day." 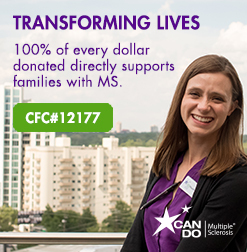 100% of donations directly support scholarships, which will enable hundreds of families with MS each year to attend life-changing programs, regardless of financial ability. Help Support Families With Multiple Sclerosis! Help provide life-changing programs for families living with MS. 100% of your gift directly supports scholarships for health and wellness education programs that transform lives. Donate today and be the hero in a family's life.